Flaky, wild-caught whole white fish fillets seasoned with real lemon and herbs. 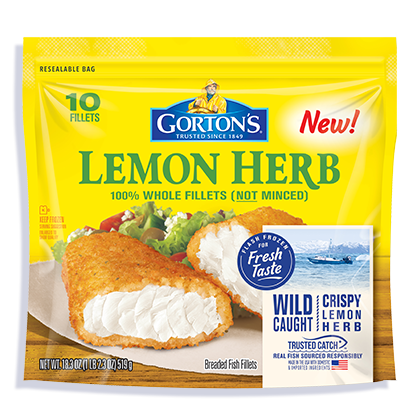 Expertly seasoned and coated in savory breadcrumbs, our Lemon Herb Crunchy Breaded Fish Fillets add a zest of flavor to any family meal. Pair with your favorite salad for a well-rounded, palate-pleasing plate. Wheat flour, water, whey, sugar, salt, maltodextrin, yeast, lemon juice solids, citric acid, baking powder (baking soda, sodium aluminum phosphate, cream of tartar), dehydrated garlic, parsley, natural flavor, spices. 110 mg of EPA and DHA Omega-3 fatty acids per serving.